Doesn't Memorial Day really put you in summer mode? While we still have a couple weeks of school left, this day always seems to kick summer into gear. We have a 32 year tradition in the upstate where I live called "Freedom Weekend Aloft" (correction...changed to the cooler sounding "ALOFT" as of this year) that we anticipate each and every year. When I was a child, the festival was held about a mile from my house. 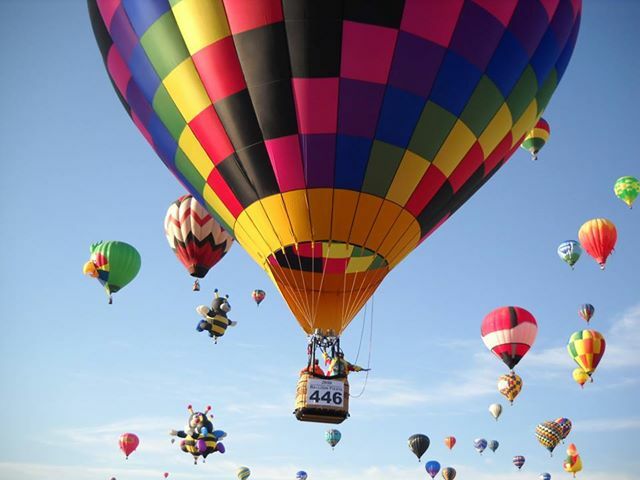 It's a weekend long festival with concerts, rides, arts/crafts, and more - but, the highlight of it are the hot air balloons! Balloonists from all over the world come to launch mornings and evenings and it is such a beautiful sight! Being SO close to the action as a child, my memories are incredible. My mom loved the balloons more than anyone else I knew and she looked forward to the weekend all year long. She would be up at the crack of down waiting for the first glimpse of one while I usually slept on until the excitement of them being over our house woke me up. Often, it was the "whossshhhh" of the fire being pumped in a balloon right outside of my bedroom window that would wake me up! I would shoot out of bed like it was Christmas morning and pull the curtains back to wave vigorously at the people in the baskets. Yes, they were so close that I could see them from my bedroom and they could see me! They were always super friendly and they were like celebrities to us kids! I would then take off outside, sometimes still in my pjs to find neighbors gathered in the road talking to the balloonists and taking pictures. Sometimes, they would be ready to land already and would ask permission to land in our yard or a nearby yard. My favorite one was a "Mr. Peanut" balloon that landed across the street one year. It was shaped exactly like Mr. Peanut and they handed out jars of peanuts, peanut pins, etc. They even tethered down and took everyone up for a view. It was always fun to watch for all of the balloons, but we (as kids) especially loved to search for unique ones that were in odd shapes. 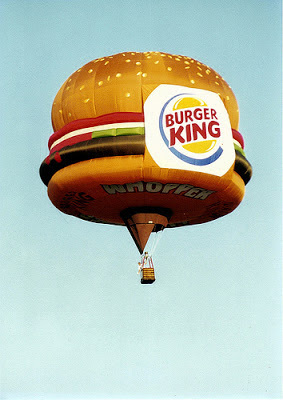 The Burger King Whopper balloon was always easy to spot! Those are some of the best memories. We really didn't know how blessed we were to have those experiences each year. Sometimes it seemed like a headache because traffic was horrendous on that weekend. A trip to the grocery store that used to take you 10 minutes could now take you an hour because of all the looky-lous and balloon chasers, but it was worth every minute! When the year came that the festival moved to a neighboring county, it was such a disappointment. Luckily, it only stayed away for a few years and then came back to our county. Unfortunately for my parents, it moved across town to a different location - closer to where I live now as an adult. So, this morning, my mom and I spent the morning watching the balloons go up and we even got to see a few land. It was magical....and it took me back to all of those wonderful memorial day traditions of childhood. Waking up to the sounds of balloons firing, get excited to see them coming down to land, and making memories with family and friends. I'll be heading to my parents house in a bit for a cookout by the pool, but then I'll be headed back home so that when the hubby gets off work (who works on Memorial Day?!) we can watch the balloons for one last time....until next year! Happy Memorial Day everyone, and a BIG THANK YOU to all, past and present, who have served to protect our country....true heroes! I'll leave you with some of the pictures we took this morning....enjoy the view! Don't forget to go pick up your 86-page SUMMER BUCKETS FREEBIE to kick off our 6 Week Birthday Celebration Giveaway! Almost 1,000 people have already downloaded the freebie! Feel free to use the image below to share it with others....it is our hope that it will help save you a bit of time during the end of the year craziness! Summer is coming, friends! Hot air balloons have a magical quality, don't they? That freebie is AWESOME by the way. Thank you so much! How fun! Hot air balloons are so neat. And thanks for the freebie! What a gorgeous site! My brother lived near a spot in Phoenix where they would take people up at sunrise and sunset. Totally beautiful! I've never seen a hot air balloon in real life! Your words about seeing them as a child were touching, and what a treat! What you said about your mom watching them so early brought tears to my eyes, I don't know why though...it just sounded so sweet :) Have a great Memorial Day! What a great tradition! 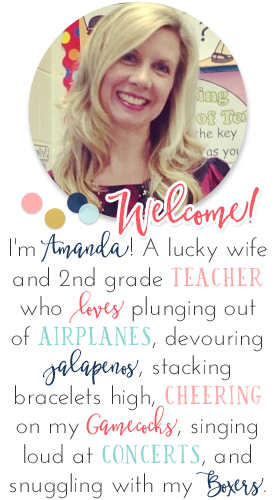 I just downloaded the freebie and LOVE it!! Thanks! I've seen one of these hot air balloons gatherings before too! They are super fun to watch!! They lifted off from a park near our house, so we could sit on the deck and watch them go by! I love the sound of hot air balloons flying over our house...breathing like dragons according to my children. Ugh! It stinks, right? Weekends and holidays....such a bummer! This is so neat! I've always thought that hot air balloons are so pretty!! They are beautiful, Lana! Y'all should travel to the upstate to see them one year! Loved looking at the beautiful pictures! It is the only sunlight I have seen for three days our way--non-stop rain. Your post reminds me of going to the balloon races in Iowa many moons ago... Thanks so much for sharing this joy! Aloft just sounds so weird without the "Freedom Weekend" in front of it! I have a few memories of going when I was a kid. My dad is a retired state trooper, so he often had to work the event. That meant the family got to go for free!! :) Very good times! I hope you had a great rest of your Memorial Day! How fun that you got to do that with your mom...I see hot air balloons all the time here where I live ( by wineries in so. cal ) but not ones as cool as that. 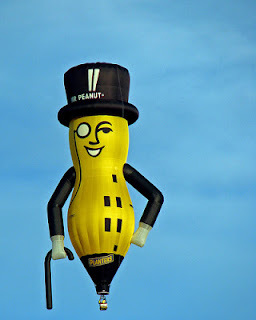 Love Mr. Peanut. Have a great last week or so...I have 8 days left. I've always wanted to go up in a hot air balloon. Thanks for sharing about the event. 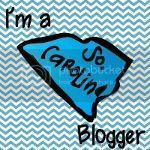 I hopped over to your blog because one of my bloggy friends mentioned all your giveaways this 6 weeks, but I decided to stay (I am now a follower)! I loved reading about the hot air balloons and it made me think about activities that make our communities unique.